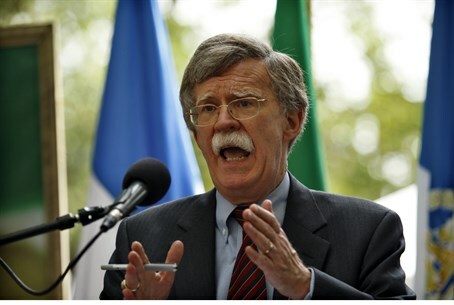 Former Ambassador John Bolton says neither US or Israel should negotiate with terrorists 'under any circumstances' - including Hamas. America's former ambassador to the United Nations has branded Washington's recent prisoner swap deal with the Taliban as "despicable". The deal, which took place on Saturday, saw captive American soldier Sergeant Bowe Bergdahl released after being held for nearly five years by the Afghan Taliban. In return, the US released five senior Taliban leaders, in a move which has been roundly criticized in some corners, and hailed by the Taliban as a "victory". Speaking to Arutz Sheva about the unity deal between Hamas and Mahmoud Abbas's PLO, Ambassador John Bolton said that it remained to be seen how long such a deal would actually last, but that "fundamentally it doesn't matter whether it succeeds of fails - it demonstrates the lack of legitimacy the Palestinian Authority, PLO, Fatah all have that they would even consider aligning with Hamas." "I think it demonstrates why the continued pressure to find a two-state solution is inevitably doomed to fail as long as anybody thinks that Hamas in any way, shape or form can participate," he added. "I don't think we negotiate with terrorists under any circumstances - that's why I think the release of Sergeant Bergdahl in Afghanistan was a mistake." Bolton, who was in New York for the 21st annual Israel Day Concert, continued by pointing to another, fundamental moral problem with such prisoner swaps. "I think it's despicable to equate an American service member trained in our doctrine to avoid harming civilians... with five Taliban leaders whose essential strategy is to kill civilians," he declared. The former US envoy said he felt the same way about suggestions that Israel should consider negotiating with a Palestinian Authority which in includes Hamas. "I think it's a mistake when Israel negotiates with terrorists," he stated. "It's a mistake, and if it means that there's no path to negotiations for the foreseeable future then so be it."